My husband in the world's biggest fan of comic strips. He always reads the Funnies first, and as he does, he laughs out loud with such enthusiasm I find myself asking, "What?!?! What is SO funny?" Sometimes comic strip humor is totally lost on me. Thanks to David's careful instruction in "Comic Strip Appreciation 101" I have figured out why. I tend to be attracted to words, so I carefully read each word in every panel, and then say, "I don't get it." To which David replies, "You have to look at the pictures!" Aha! It is so true. Isn't that the beauty of the Comic Strip? The humor is always found in the marriage of the words and pictures. In France, comic strips are called, "les bandes dessinées," or "les B-D" for short. 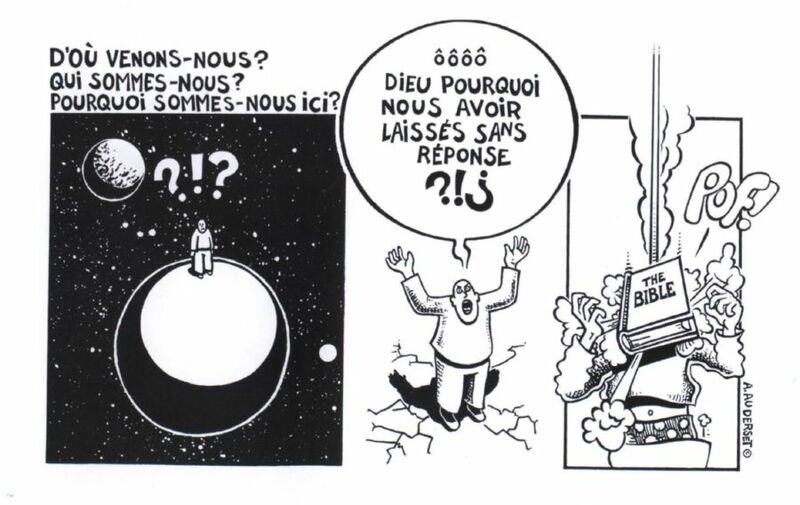 This week in our French Biblical Language class, we were introduced to the works of Alain Auderset, a French Christan comic strip artist. I'd like to share with you a sample of his work. In many ways, it needs no interpretation, but for you grammar geeks like me, who gravitate towards all things linguistic, I will provide one. 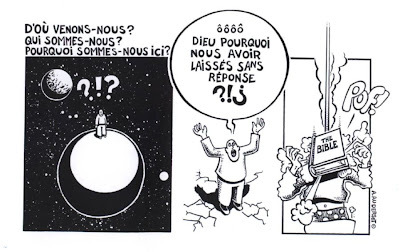 In the first panel the mans wonders, "From where did we come? Who are we? Why are we here?" In the second panel he cries out, "God, why have you left us with no response?" In the third panel, well, look at the picture!